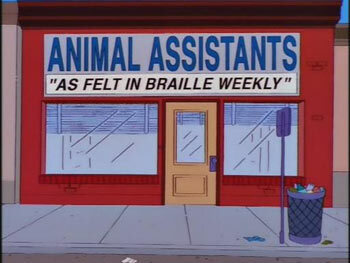 The signs on the Simpsons are always next-level jokes. 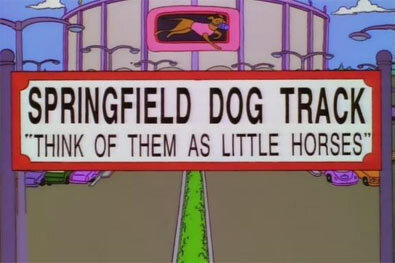 This is not a comprehensive list of the best signs ever seen on The Simpsons. 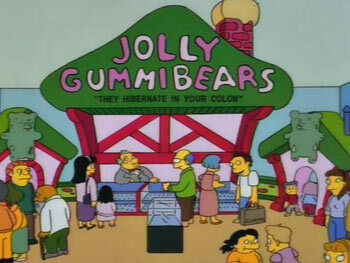 Because I don’t think that it would be possible to put together the 11 greatest signs on The Simpsons. 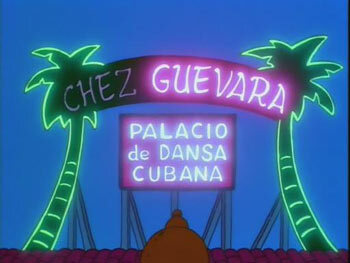 Every single episode features at least three or four signs and, without fail, they’re clever. Business names, business slogans, messages on the church sign… for 20 years now, the writers have almost never missed. From the episode where Homer’s accused of sexual harassment — but, more importantly, the episode with the candy convention, one of the greatest segments ever. 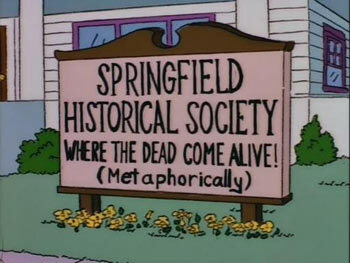 I guess they needed to clear up that it’s not the home of Jebediah Springfield’s zombie corpse. Because no matter how embiggened you are, if you see the dreaded pirate Hans Sprungfeld coming at you, you’re going to run. A great statement on branding. 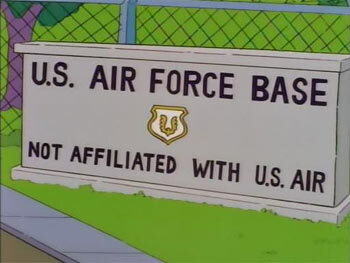 Even the Air Force wants to make sure no one confuses them with U.S. Air. Another one that made me laugh out loud. Makes me want to go get a helper monkey. I love this sign because it says SO much by saying so little. 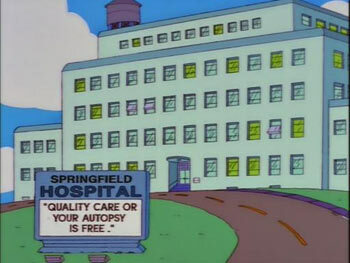 It also really summarizes the philosophy of Dr. Nick AND the Hollywood Upstairs Medical College. 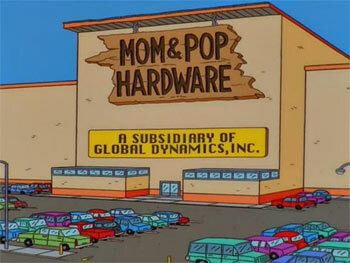 Such brilliant social commentary on the hardware store industry. Summing up the effect of Home Depot in one quick sign. The problem: This is actually a decent slogan for a place like this. 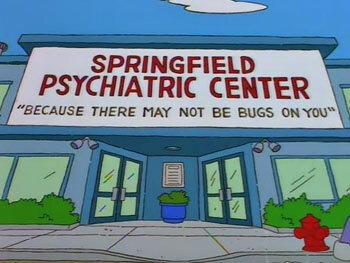 (This one is from the Marge “Fear of Flying” episode, by the way — not when Homer and Michael Jackson are locked in a mental institution a few seasons earlier. I like the fear of flying episode for the ‘Blowenstein. Blowenstein.’ bit toward the end. And Homer impersonating a pilot at the beginning. 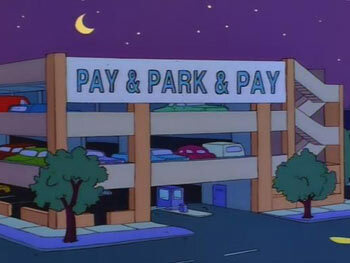 Great episode (the Sideshow Bob episode runs for governor episode) and a great sign — one that reflects the lifelong dream of everyone in the obnoxiously overpriced parking industry. Yes, this is the best. No, you probably won’t get it at first. Just give yourself a minute to stare at it to try to figure it out. 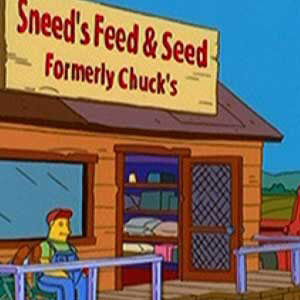 Because once you get its alliterative subtlety, you’ll realize that The Simpsons slipped this dirty, dirty sign past all of us… and that it is, quite possibly, the cleverest sign of the entire run.